Creative Work from Home Moms, get ready to add this list to your arsenal of resources! Photographers, Illustrators, Etsy Store Owners, Designers, Freelancers, Marketers, and BossMoms alike, this resource list covers a broad range of creative work from home jobs. Let's dig in! What in the world is Dubsado? Well, in short Dubsado is a client management system and so much more! I absolutely LOVE this software and can't brag enough about it. You can send contracts, accept credit cards, send questionnaires, track leads, create workflow/automation with forms for your site, provide client portals for all your work, sync with your ICal/Google Calendar, manage to-do lists, streamline your online invoicing, and more! My absolute favorite feature of Dubsado are the form templates. You can build proposals, questionnaires, contracts, sub-agreements, and lead captures from scratch or start with one from their template library. Build proposals, questionnaires, contracts, sub-agreements, and lead captures from scratch or start with one from their template library. "We are very sorry for the downtime many of you experienced today. We run a tool that helps run your day to day business and we understand that this is your livelihood. We have addressed the issue and have put additional procedures in place to make sure this does not happen in a similar fashion in the future. But we look forward to the features we have coming this week. Thank you everyone for your patience and support in our business. Nothing says sorry like coffee, grab it while it lasts 😉 To redeem a coffee on us, just take this to your Starbucks and instead of paying, they will scan this barcode... like a gift card." Absolutely amazing! You won't find many other companies with this level of genuine care for their customers. I appreciate that! Surprise welcome kit. 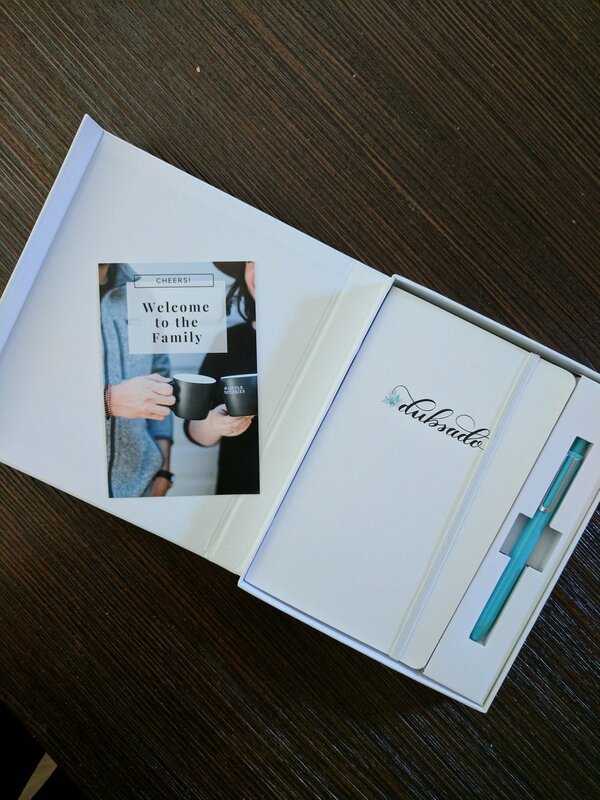 Although not advertised on their site, upon joining I received a thoughtful welcome kit. This was certainly a pleasant surprise and very appreciated. Now there are certainly other client management systems out there. You are welcome to check them out (Honeybook, 17hats, Tave). I've tried out each of these and I personally think Dubsado is the best for creative work from home moms. Honeybook is probably the second best option for a creative work from home mom. It has a lot of great features and some that even go beyond what Dubsado offers. However, it is a little out of my price range ($40/month) in comparison to Dubsado's $20/month. I should note they will increase prices August 1st! I also wasn't a fan of being required to provide my phone number in order to test out Honeybook. Because I had to provide my phone number I ended up receiving phone calls from Honeybook. Not a fan of that. If you decide to use Dubsado, please use my referral code 'hodgesdesign' or use my referral link. You'll save 20% off your first month (Save $4) or first year (Save $40!). Cloud storage has been an absolute must have for me! What is cloud storage? In a nutshell, cloud storage is additional storage space for all your computer files that exists outside of your hard drive. Why might you need this? As a backup in case your hard drive dies and you lose ALL of your files and hard work. You also lose all the files for any clients you have worked with. Gone. Forever. Now you may be thinking, "This will never happen to me! That doesn't happen to a lot of people." Well, it happens all the time. While I was in college from 2009 - 2013, it happened to me twice on the same computer! The first time it happened, I lost my final project that I had been working on for an entire summer semester three days before it was due. So, I implore you to use cloud storage! You can easily sync it up to your computer so that it works seamlessly with your current file setup on your computer. Most storage options give you FREE storage to start with! Social media promotion can be a bit of a hassle. Buffer is a great way you can schedule all your social media posts in advance. This tool is also great to schedule posts at optimal posting times. Buffer also offers a new feature called Pablo which allows you to quickly create engaging image-based posts. Buffer starts out with a pretty extensive FREE plan. If you haven't heard of Canva, I am about to make your day! Are you bad at graphic design? Don't have a clue what size graphics to use for social media? Want graphics for your business that you can personalize yourself? Don't have a large budget to hire a professional like me? I am happy to help a Mompreneur in need! If you answered yes to any of these questions, Canva was made just for you! With Canva you can easily create designs for your business using premade templates and layouts. The best part? You can use Canva for FREE! Easy to use like Canva. Quickly and easily create animated videos for social media. Adobe Spark can also be used to create static graphics like Canva. Pixabay offers FREE high-quality stock photos, videos, vectors, and art illustrations that are free of copyrights under Creative Commons CC0. You may download, modify, distribute, and use them royalty free for anything you like, even in commercial applications. Attribution is not required. Pexels is also another great FREE stock photo resource. I'm sure you've used Pinterest as a big source for your project inspiration. As a creative, Inspiration is VERY important! You may even use Behance as a resource for inspiration. I'd like to entice you to try out Dribbble. You can utilize this resource similar to Pinterest. Dribbble has buckets (Like Pinterest Boards). You can save work to buckets and follow artists. One great thing about Dribbble, that makes it stand out, is the ability to download color palettes from any project you run across. One of my favorite FREE resources is Trello. It keeps my freelance work organized and helps me manage my projects. One nice feature is the ability to collaborate boards with other users. This can be really helpful if you have clients you work very close with or if you contract with larger companies. Trello gives you the ability to collaborate on specific boards where clients can create "To-Dos" and vice-versa. I recently discovered Typeform and I am in love! We have all filled out plenty of online forms. Let's face it, they are kinda boring right? Wait! We aren't boring! We are all awesome Bossmoms! Typeform takes the typical online form experience and makes it exciting with a beautifully designed user experience! You can use these forms for lead captures, questionnaires, and more! Best of all? Their basic plan is FREE! If you follow my blog posts, you know how much I LOVE Creative Market! Have you seen their blog? It is my all-time favorite blog. I follow it religiously! This blog is overflowing with amazing content, downloadable guides, printing trends, designer self-improvement, freelance tips, how-to posts, and more! Creative Market also releases 6 FREE design goods every week. Add to my list! I'd love to hear about the resources you use in the comments below!